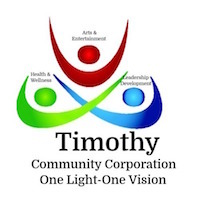 The mission of Timothy Community Corporation (TCC) is to strengthen the community by Connecting, Sharing and Serving; providing the individual opportunities to grow physically, emotionally, and spiritually. Timothy Community Corporation will be an incubator for resources. This incubator will serve as a warm, inviting environment that drives individuals to impact the community. Those touched by TCC will be strengthened through a process of learning, healing, and serving.